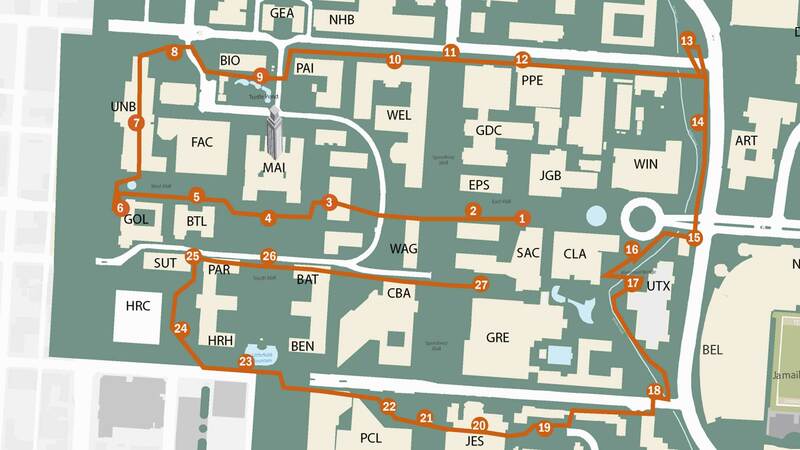 This self-guided walking tour of sustainability at The University of Texas at Austin should take about 50 minutes and covers a bit more than 2 miles. If you prefer, download and print the tour. Sustainability asks us to seek the balance in the environment and in social justice. Unveiled in 1999, this bronze sculpture was the 2nd statue of the civil rights leader on a college campus. Students initiated the project in the late 1980s, and students in the 1990s funded the sculpture $1/student/semester over 4 years. 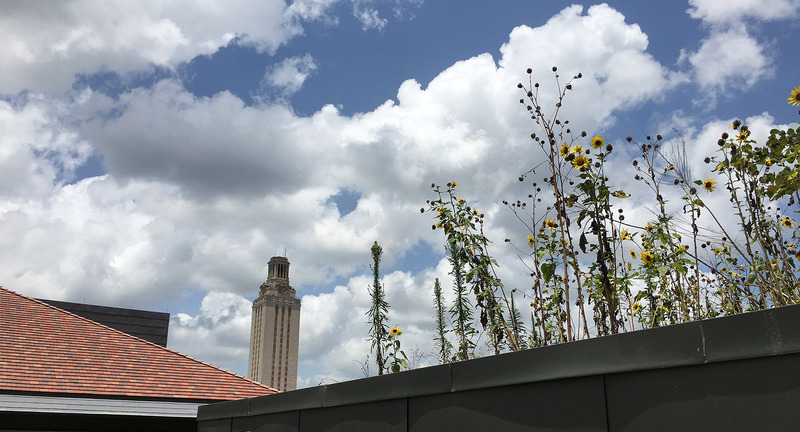 One of the first academic programs affiliated with sustainability at UT Austin is a B.S. in Environmental Sciences (begun 2010) with 126 graduates of the program to date. ESI includes a public outreach program begun in 2000: look for upcoming Hot Science—Cool Talks or watch videos online. Walk W across Speedway & up steps. This is the original Forty Acres—a hill set aside for a university in 1840—bound by Speedway, 21st, Guadalupe & 24th. UT today = 430 acres. The two unmoored buoys, titled The West by Donald Lipski, is one of 28 sculptures on loan to UT from the Metropolitan Museum of Art in New York. It is part of UT’s public art program, Landmarks. After a xeriscape is established, watering can be reduced as much as 75%. 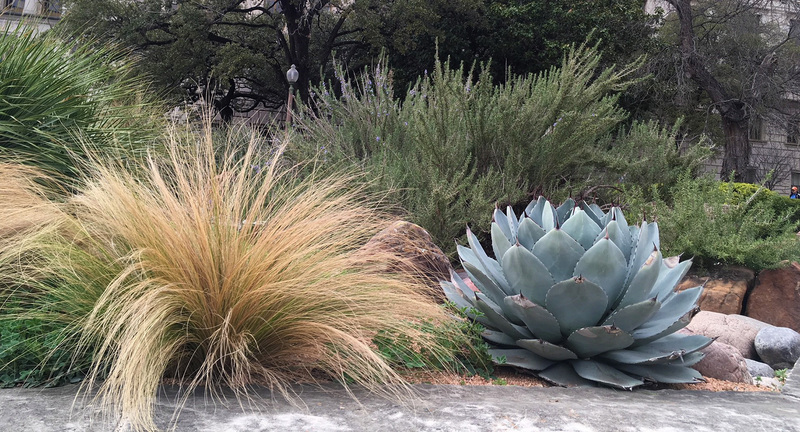 These beds of native plants (red yucca, prickly pear, and Texas sotol) were developed in 2011, replacing high maintenance, traditional roses, jasmine and boxwood. Note the deciduous, native honey mesquite (Prosopis glandulosa) to the N: these thorny, deeply rooted trees were common on the Forty Acres in 1883 when UT Austin opened. Built in 1937 of limestone quarried in Bedford, Indiana, UT’s Main Building was designed by Paul Philippe Cret and is 4 ft shorter than the Capitol. A peregrine falcon has a nest box on the N side. Every year, Tower lights are turned off for an hour to highlight energy conservation. Regular energy conservation efforts include Longhorn Lights Out, a student organization that holds a Friday night session once a month to turn off lights and unplug unnecessary electronics. Since 2013, they have saved ~173,454 KWh (148.5 months of electricity for the average Texas home). In 2007, a statue—initiated and funded by students—of labor leader Cesar Chavez was unveiled, the first depiction of a Latino on campus. Battle Hall (BTL) is listed on the National Register of Historic Places & was the first building on campus to employ the signature motif of the Forty Acres: modified Spanish Renaissance. 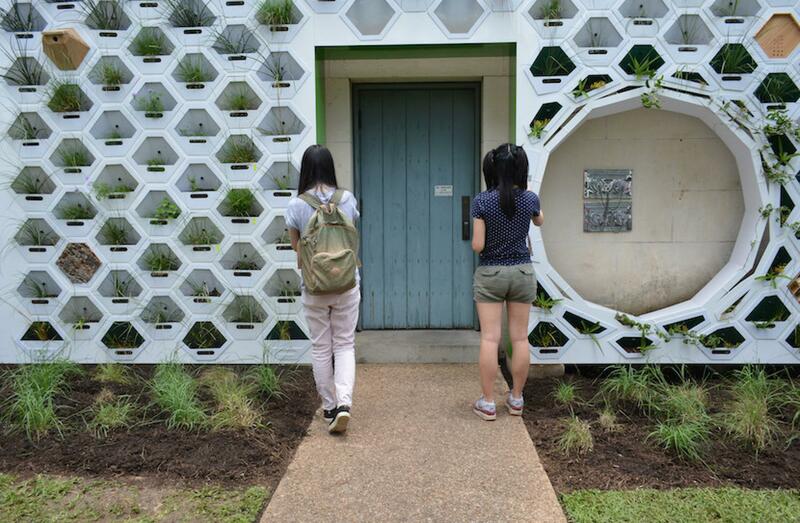 A project by the School of Architecture and the Lady Bird Johnson Wildflower Center, this living wall exemplifies research using the campus as a living laboratory. It is funded by Green Fund, a half million/year grant program made up of fees collected from each enrolled student. Since 2011, Green Fund has funded over 120 projects on campus, from adding new water bottle filling stations to researching the best landscape design for UT Austin’s McDonald Observatory in West Texas. UNB was designed by Cret to be a campus community center. Look for bins and signage in the Union demonstrating UT’s Zero Waste goal to divert 90% of the total waste from landfill. Recycling is single-stream: paper, cardboard, plastics, aluminum and glass are recycled together. Recycling at UT started in the 1990s, and—with a 2002 effort to start outdoor collection of recyclables—led to the creation of the largest environmental student organization, Campus Environmental Center. CEC has served as an incubator for green ideas on campus: past projects have become permanent programs (Tailgate Recycling, Orange Bike Project & Green Offices). The three largest live oaks (Quercus fusiformis) have been rooted on this hill for about 300 years; Dr. James Battle prevented their destruction in 1923. The bronze statue of civil rights leader Barbara Jordan—the first of a female public figure on campus—was an Orange Jackets student-led initiative. Jordan was a professor at the LBJ School of Public Affairs for 17 years as well as the first African American elected to the Texas Senate after Reconstruction and the first Southern African-American woman elected to the US House of Representatives. Cross Whitis & walk SE toward Tower, turning onto path along Biological Labs. Look for specimens of coral bean, Texas almond & other named plants on your left. 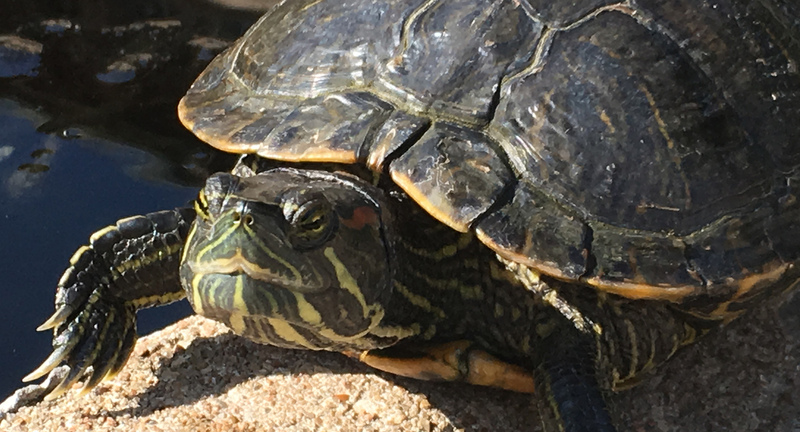 The turtle pond was finished in 1939 and is home to a few dozen turtles of multiple species, including snapping turtles. If you look E, the greenhouse is being used for research in aquaponics by student org Engineers for a Sustainable World. Funded by Green Fee, tomatoes, broccoli and other veggies are grown in water, saving up to 90% of the water used for traditional crops. Inventoried trees on campus are tagged, and utaustin.treekeepersoftware.com has info about each using the aluminum "UT 2016" tag. Tree 1405 is an osage orange (Maclura pomifera) that provides an estimated $173/year in ecobenefits to campus. This species was preferred for bow construction and had a native range restricted to the Red River drainage of OK, TX & AR but was likely planted in MO where Meriwether Lewis collected it. Look across the street to the live oaks on N side of 24th: these trees are transplants, relocated to make way for the Hackerman chemistry building. 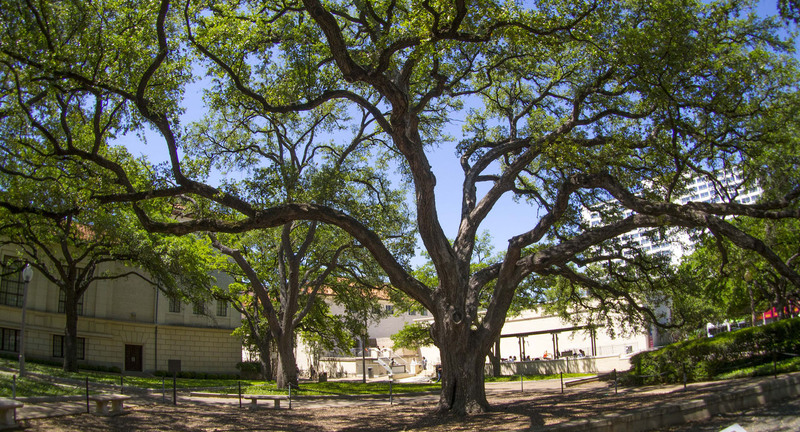 UT has successfully moved over 50 mature trees since about 2002. In the last decade, UT has added over 3.6 million sq ft of green, LEED-certified building space. Completed in 2010 and named for a former UT professor and president, this LEED Gold building has solar water heating panels on the roof (look back at Stop 12), an energy efficient HVAC system, and chilled water that runs 40 feet underground and is connected to a 4 million gallon water storage tank. Hackerman is also a science building with Green Labs, a certification program run by students that reduces waste, power, and water usage and includes recycling of batteries, Styrofoam, nitrile gloves, & cold packs. 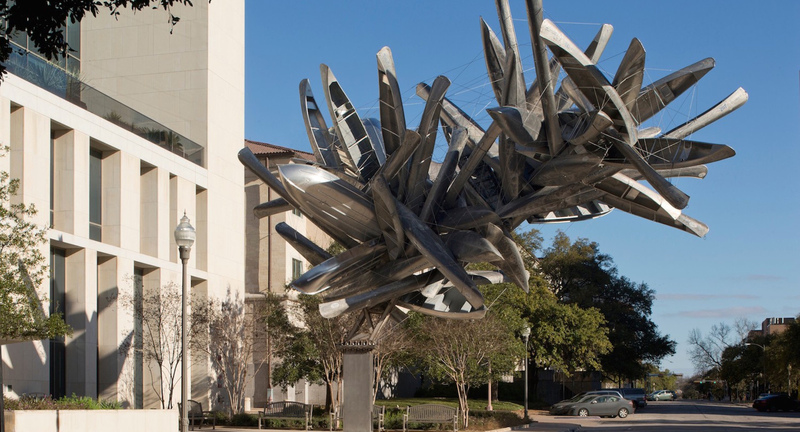 The site-specific sculpture of 70 repurposed canoes and boats is Monochrome for Austin by Nancy Rubins, another piece from UT Landmarks. Continue down hill on W side of 24th St. You might see a blonde fox squirrel (Sciurus niger), one of 6 species (2 genera) of squirrels in North America. UT legend calls them albino (they are not) and says sighting one brings luck on a test (let’s hope so!). Please do not feed the squirrels: as their population increases, trees are damaged. 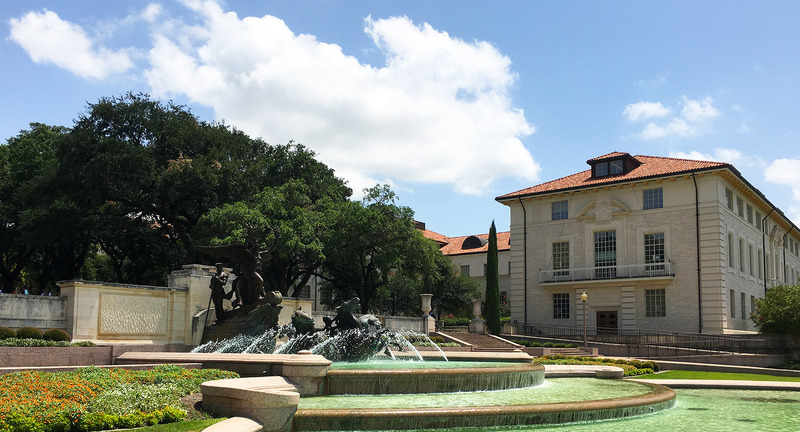 UT has had its own power source for nearly a century and in the 1930s switched from coal to cleaner natural gas at the insistence of Professor Carl Eckhardt. One of the most efficient power plants of its kind in the world, UT’s overall efficiency increased from 48% to 86% from 1976 to 2013; over that time period, campus grew but met all energy needs without more fuel. In a typical year, 345,000,000 kWh is produced, 70% for campus and 30% to chill water in 18 chillers that cool campus (UT saves 100 million gal of potable water/year in chillers using groundwater and recovered A/C condensation). Check out the energy portal. Energy savings are also gained through optimizing buildings like CLA (Stop 16) which reduced consumption by 25%. In 2014, UT received the first ever PEER Campus designation for infrastructure with the addition of 15,000 ton Chilling Station 7 and a 4 million gallon thermal storage tank to support Dell Medical School. The Orchard, started in 2013, highlights fruit trees that grow well in this region of Texas (peach, plum, Japanese persimmon, fig, and others). A small pollinator garden of native and adapted plants is a new addition, as is a bench made of wood harvested from a campus oak tree made by the Carpenter Shop. New projects include monarch butterfly way stations and a larger pollinator garden on the S side of the Swim Center. UT’s Landscape Services has recently removed invasive, non-native vegetation from Waller Creek, often leaving stumps to inhibit erosion. The Texas Palmettos (Sabal mexicana) are volunteers naturalizing north of their historic range. These palms are likely descendants of the old palm planted at Arno Nowotny Building and are thriving in Waller Creek with the aid of a warming climate & the Austin urban heat island. Texas’ flora has included palms for millions of years, and petrified Sabal palmwood is the Texas State Stone. Tree 3947 is a Durand oak, a rare species with a highly fragmented population, it prefers to grow in rich alluvial soils near waterways. In the Stadium, the Sustainability Squad sorts trash to reduce what’s sent to the landfill. During the 2017 football season, 691 volunteers helped out for a total of 2697 hours to decreased landfill waste by 207,792 pounds, making UT Austin #5 for the National Game Day Recycling Challenge. The inaugural food recovery program provided 3266 meals to Central Texas families in need. UT’s alternative transportation is also visible: the bus system is free to people with a UT ID, making the shuttle system one of the largest university systems with 5.2 million passengers/year. Carpooling, car sharing and biking are also options for getting 70,000 students, faculty and staff to campus. This LEED Gold building houses one of the newest of the 156 undergraduate programs: the popular B.A. in Sustainability Studies with (already) 160 declared majors. The program is housed in the Department of Geography, and its curriculum includes classes from nearly every college on campus. 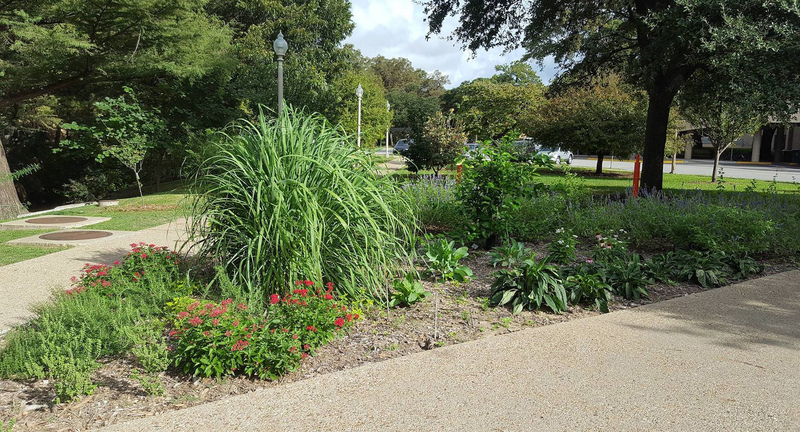 The traffic circle median contains a special grass, Habiturf, developed with years of research by the Lady Bird Johnson Wildflower Center. The turf grass is drought tolerant & ideal for Texas’ extreme weather. Cross bridge over Waller Creek near CLA and follow W bank to the S. If the Memorial Bridge—the oldest bridge across Waller—is closed, return to San Jacinto and walk S.
Charles Umlauf taught fine art at UT for 40 years, and this bronze mother & child exemplifies his work. Tree 4036, a 65 ft tall bald cypress (Taxodium distichum) planted in 1936, provides an estimated yearly ecobenefits of $367. Waller Creek is a 3662 acre watershed on top of Cretaceous limestone; Austin is on the eastern edge of what had been a shallow sea. Look upstream to see if you can spot urban wildlife, including herons, blotched water-snakes, red-shouldered hawks, foxes, and raccoons. A student group built the Jester and Kinsolving gardens in 2013. 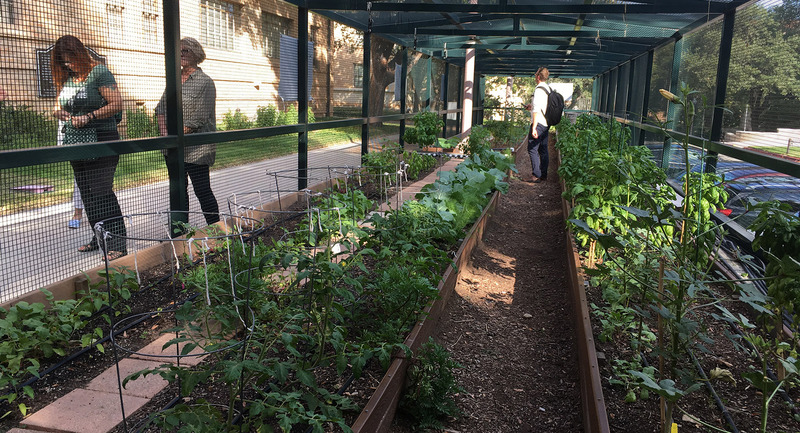 The group grows food, educates the dorm community about sustainability, and operates the UT Farm Stand (nationally recognized by the National Association of Food Service in Higher Education). Produce grown at this location is used by chefs, and the 7,000 gal tank captures rainwater and irrigates the crops with a solar-powered pump. When this dorm opened in 1969, it was the largest in the U.S., and it still provides a home for 3,000 students. Sustainability in UT Housing and Dining has reduced waste related to food production & consumption—important given that 30,000 meals are served daily. Changes include the introduction of reusable ECO2GO containers with over 1 million uses, the addition of compostable paper plates, the preference that 25% of food purchased is locally grown, the addition of Meatless Monday, and new choices in packaging to achieve zero waste goals. Beginning in 2008, students conducted plate waste studies to determine the amount of edible food wasted in buffet-style dining halls. These studies led to changes such as the elimination of trays, which in turn led to a 50% reduction in food wasted. Extending the campus living room to the outdoors, the Speedway renovation turned an asphalt road into a walkable mall. The project highlights the live oaks & decreases impervious pavement by 20%. The Austin B-cycle station outside of JES is one of nine that provides free alternative transport for UT students. This solar charging station near the library (PCL) is a Green Fund funded student project. Fountains only operate on special occasions because of UT’s water conservation plan. 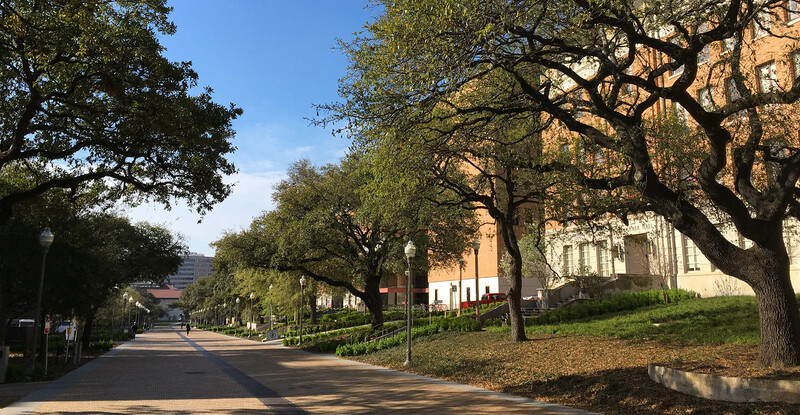 UT uses a central system to manage the irrigation usage across campus and has reduced irrigation usage by 66% since 2010, conserving over 100 million gallons of water (or $719,000) annually. Check out the irrigation dashboard. This Green Fund funded project added native plants to beds. Students who lived in Dobie residence thought the landscaping needed a refresh and—with the collaboration of landscaping and HRC—found a way to revitalize the space. 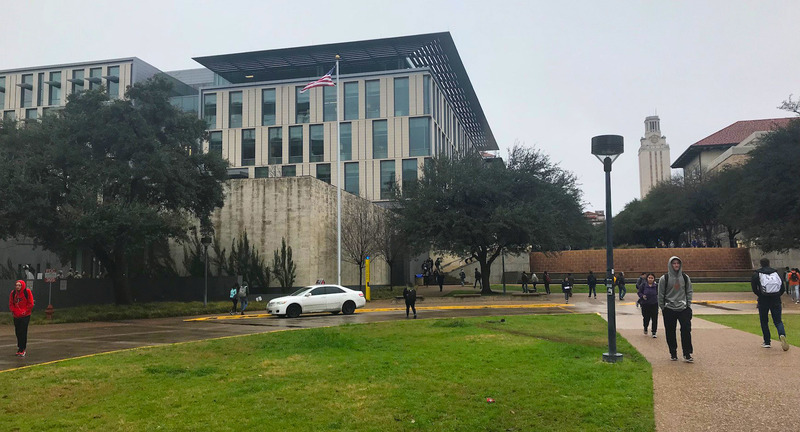 Look up to see two silver blocks on a metal platform off West Mall Building (WMB) where School of Architecture (UTSOA) tests building materials like window treatments, glazings, facade designs and others to reduce energy consumption. UTSOA degree programs focus on sustainable design and city planning. The removal of Confederate and other statues from this area gained national attention, so this is a great spot to look at the Texas Capitol and reflect that sustainability is also about how society functions. The live oaks are part of broad tree conservation efforts to reduce impact to root systems. UT has been part of Tree Campus USA for the last decade. Students led the drive in 2009 for this campus hub to achieve LEED Gold in 2012. See the Student Commitment to Sustainability plaque on the wall in the corridor. For a different look at UT, head to the 3rd floor roof garden that includes a UT Landmarks piece by James Turrell, The Color Inside. To make a reservation to experience the sunset light sequence visit turrell.utexas.edu. Thank you for taking The University of Texas at Austin sustainability tour! We'd like to hear what you think, and Bleed Orange, Live Green!